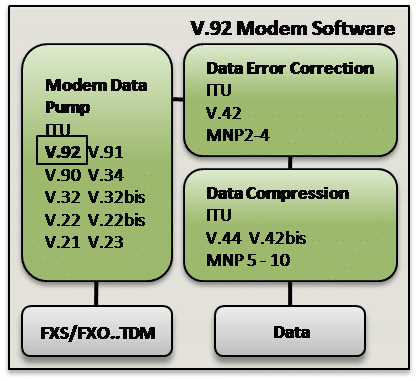 VOCAL’s V.92 modem software features include Modem-on-Hold (MOH), PCM upstream (PCMU) and Quick Connect (QC). Each of these features can be used independently. Contact us to discuss your modem application requirements. V.92 specification allows a PCM upstream rate from 24,000bps to 48,000bps. The rate increments in steps of 1.33 kbps as in V.90. Upstream rates could be 24k, 25.3k, 26.6k, 28k, etc. V.92 represents a 30% increase over the 33.6K bps attainable by V.90 modems. This higher upstream speed offers numerous benefits including a reduction in the upstream data transfer time for large e-mails with attachments and for ftp site uploads, as well as improved operation for interactive applications. Due to the real conditions of the phone lines the 48 kbps upstream can be difficult to obtain even with the V.92 softmodem features. V.92 softmodem features allow modems to stay connected “on-hold” while you take an incoming call waiting call, or initiate an outgoing voice call (works only if the V.92 server modem is configured to allow this feature). The amount of time you can place your Internet connection on hold while taking another call will be up to your Internet Service Provider (ISP). The V.92 recommendation permits ISPs to set their modems to wait for 0 to 16 minutes, or, to wait indefinitely. V.92 client modems may include software that will warn the user when the ISP determined timeout approaches, as well as to display call waiting caller ID info (this feature requires telco call waiting/caller ID service). ISPs have an incentive to limit the use of this feature: when a call is placed on hold, the ISP modem remains unavailable to take other calls. The ISP may need to add more modems to maintain quality of service if this feature is enabled. The ISPs also have the option of not accepting modem-on-hold if the total time of modem-on-hold in the same session is greater that a predetermined value. V.92 softmodem features allow the time to establish a connection to be reduced with faster handshaking, using a short phase 1 and phase 2, which shortens the connection time to about 20 seconds. Using a feature not in the ITU V.92 recommendation, it is also possible to further reduce this connection time to around 10 seconds with short phase 3 and phase 4 by forcing V.92 modems to remember line conditions and connect rates on past connections and storing data about those connections in a buffer. As the V.92 client modem dials in to a server, it will compare line quality variables with those in the buffer, and if a match is found, the handshake starts at the rate previously negotiated. Quick Connect will also be used with Modem On Hold: when a call is switched back to the modem after using the MOH feature, a retrain is required. When the V92 modem uses short phase 3 and phase 4 and the line conditions are different, the V.92 modem have to fall-back to a full retrain.